“Organic” refers not only to the medicinal herbs themselves, but also to how they are produced and processed. Organic agricultural production is based on a system of farming that mimics natural ecosystems and maintains and replenishes the fertility and nutrients of the soil. 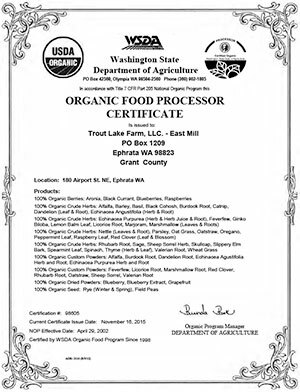 We are certified organic through the Washington State Department of Agriculture as producers and processors. Our record keeping and verification process assures you that your herbs are rigorously inspected, documented, and verified from seed to shipment in accordance with FDA organic guidelines. Certified organic is our first line commitment to quality. Our products have been grown and handled according to strict organic standards. We keep detailed records of all processes. We periodically test soil, water, and the herbs themselves to ensure that we are meeting or exceeding the standards of the USDA National Organic Program (NOP). We use only NOP approved pest control methods and do not promote or employ irradiation or genetic modification. 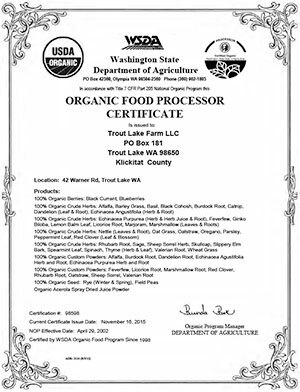 Our facilities are inspected by the Washington State Department of Agriculture on a regular basis to ensure compliance. We are in compliance with the guidelines of the European Union, Canadian Organic Regime and Japanese Agricultural Standard as certified growers and processors.